Such is the beginning of many folk tales featuring Ilya Muromets. He is strong and fearless, he waves his mace to crush trees or else simply uproots them with his bare hands – all this to help his fellow villagers build a road through the forest. He can defeat terrifying monsters: Zmey Gorynych (the three-headed flying serpent) and Solovey Razboinik (Nightingale the Robber). He boldly challenges Idolishe Poganoe (Tainted Beastgod), a knight corrupted by evil forces who threatens the integrity of Great Rus (the medieval name for Russia). For nearly a millennium, tales of Ilya Muromets have been passed on from generation to generation. In traditional fables he is a wise elder, whereas in the most recent cartoon – Vladimir Toropchin's “Ilya Muromets and Nightingale the Robber” – he is a dynamic and rather muscular young man, determined to gain the favours of a voluptuous blonde (a princess, of course). Films, cartoons and even video games have been dedicated to his eventful legendary life. All of these unlikely representations are united by one determining feature: physical and spiritual integrity, dedicated to the protection of the Homeland and People. Out of the three Russian folk heroes, the so-called 'bogatyrs' (Ilya Muromets, Dobrynia Nikitich and Alyosha Popvich), Ilya is the most famous one, as well as the group's leader. More stories are associated with his name and, unlike his mythical counterparts, the stories about him have a distinct chronological structure. More extraordinary yet is how Ilya became a defender of Rus in the first place. The best description lies within the folk tales themselves, so it is best to turn to them for answers. And so here we are, on the outskirts of Murom-town (from which Ilya Muromets takes his name), in the village of Karacharovo, where Ilya lives with his peasant mother and father. The bogatyr-to-be is thirty-three years old and he has spent all these years lying on a stove. Mind you, the traditional Russian stove is more than just a cooking appliance, so Ilya wasn't frying. The top of the stove is a warm flat surface, making it the favourite resting place in a Russian peasant home. It is also where, according to the legend, Ilya Muromets spent the first thirty-three years of his life. “Thirty and three years lay Ilya Muromets on his stove,” says a well-known Russian joke. “Russia has never seen such a hangover!” But it wasn't laziness or a hangover that kept Ilya from doing good deeds – it was a curse put on his grandfather that prevented him from walking. This mysterious curse was lifted as strangely as it appeared. It is a bright summer's day, probably the Ivan Kupala holiday, which takes place in the end of June. Ilya's parents are out working in the fields and he’s lying there on his stove, miserable and lonely. Suddenly, there is a knock on the door: three religious wanderers ask Ilya for some drinking water. He would be glad to help, but explains that he can't get up from the stove as he is paralysed. One of the wanderers turns to him and says: “Stand up and stretch your frisky legs, get off your stove, for you are completely cured”. Ilya does as he is told and, indeed, he is not only able to walk, he also discovers that he has acquired super-human strength. He wants to thank his saviours so he gives them the best food and drink he can find in the house's cellar. But it is not full stomachs that the three wanderers are after. They tell Ilya of his destiny: to be a bogatyr and to defend his homeland. So, after saying goodbye to his befuddled yet happy parents, Ilya finds himself a powerful stallion tenderly called Karkusha, and sets off to do good deeds for the people of Rus. What follows, according to the tales, is an avalanche of great exploits and victories. 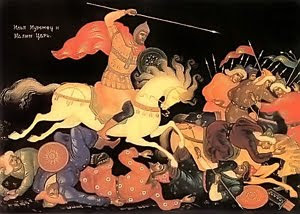 Ilya Muromets single-handedly defends the city of Chernigov from invasion by the Tatars and is offered a knighthood by the local ruler, but Ilya declines to stay. In the forests of Bryansk he then kills the forest-dwelling monster Solovey-Razboynik, who murders travellers with his powerful whistle. Ilya Muromets becomes the greatest defender of Rus against all of its enemies, both real and fictional ones. Tatars, bandits, three-headed flying serpents, possessed knights and even princes – nobody is a match for the bogatyr's superhuman strength and determination to dispense justice. Traditionally, he is portrayed as the eldest of the three bogatyrs, with a grey beard and a mighty stature. Despite his modest origins, he was universally respected amongst his counterparts not only for his strength, but also for his worldly wisdom. Legends of Muromets probably originate from difficult period when Russia was under the Tatar yoke and ancient cities had to fight for their independence. He became a symbol of freedom and patriotism. Ilya Muromets is not only the most famous hero of the Russian epos; he is also the most complex one. Most Russians are genuinely surprised by the existence of a St. Ilya Muromets in the Russian Orthodox Church. Indeed, the story and the symbolism behind the legendary bogatyr is much richer than simply a children's tale. Ilya Muromets is said to have a very specific historic prototype. Historically, he was a muscle-man called Chobitko who, just like the folk protagonist, lived in the town of Murom in the late 1100s. As early as 1594 the Austrian ambassador to Russia, Erich Lassota, encountered Chobitko's remains in a cave near Kiev. He was told that Chobitko was a bogatyr and had been given that name after an incident when he beat off enemies using a chobot (an old Russian word for boot). 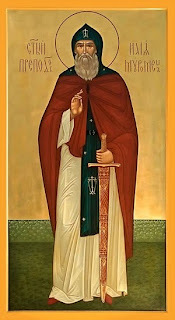 Chobitko became a monk in Kiev later in life and was canonised in 1643 as St. Ilya Muromets. Little is known about his life, apart from the fact that he was a warrior and a clergyman. Records also point to his peasant background and to the fact that he suffered from paralysis until he was miraculously cured. Before taking his monastic vows, Chobitko was a member of the royal bodyguard. It was probably during his numerous clashes with the Tatars that he received the numerous wounds which forced him to leave military life and substitute it for religion. However, it is very difficult to describe Chobitko as a conventional religious man. According to some records, after a fight with one of the local rulers, the angry bogatyr shot crosses off churches using his bow and arrow. In 1988, an interdisciplinary committee analysed the relics of St.Ilya Muromets stored at the Kiev-Pecherski Monastery. Their investigation showed that the remains belonged to man of above average height for that time (177 cm), who suffered from an incurable spine defect and deformities at the extremities. Traces of battle wounds were also discovered, showing that Ilya was probably killed during the siege of Kiev in 1204. 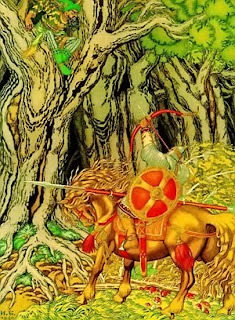 How he was cured and how he was able to participate in battles remains a mystery, yet it was obvious from the remains that the life of the factual saint bore many similarities to that of the mythical bogatyr. Over the centuries, Ilya Muromets' canonical image has been preserved, yet he has also gained popular acknowledgement in new, adapted forms. He is the protagonist of many literary works, the hero of numerous movies (e.g. 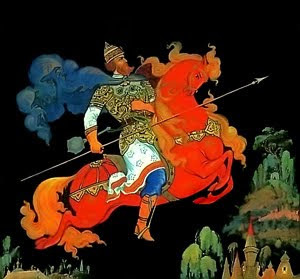 Aleksandr Ptushko's film Ilya Muromets), paintings (e.g. Bogatyrs and Ilya Muromets by Viktor Vasnetsov), monuments and cartoons. There’s even an aircraft named after Ilya Muromets. Designed by Igor Sikorsky it was Russia's and the world's first four-engine strategic bomber.